vena cava and used a novel two-snare technique to slenderize the device into the sheath. This report highlights additional tips in transcatheter device retrieval. Device closure of secundum atrial septal defect is safe and effective with a low incidence of complications.,,,, Device embolization may occur (0.4-0.6%) and in experienced hands, successful percutaneous retrieval is reported in up to 70% of the cases.,,,,,,,, With the availability of multiple closure devices, the techniques of retrieval need to be modified as per device construction. We describe a case of device embolization of Figulla Occlutech device, which was retrieved successfully from the right ventricle. In addition, we discuss important technical aspects pertinent to the retrieval of this device. A 26-year-old woman with a large secundum atrial septal defect and mild pulmonary hypertension was evaluated for transcatheter closure. 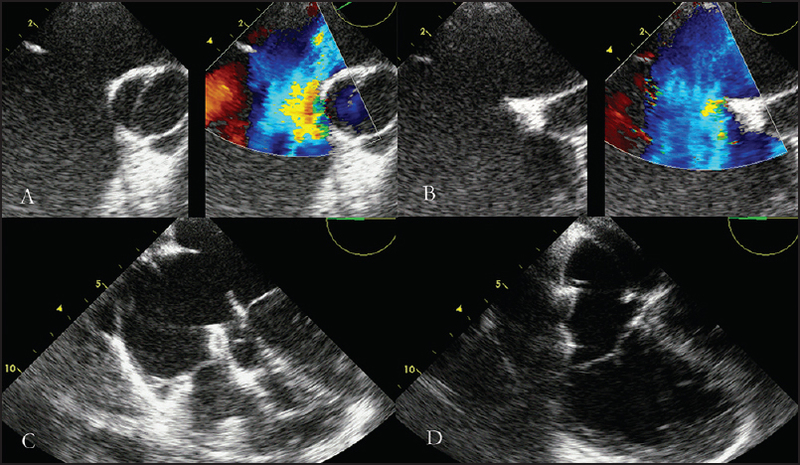 Transesophageal echocardiography revealed a large defect (31 mm × 29 mm × 30 mm) with deficient aortic rim [Figure 1]a and [Figure 1]b. The patient was taken to the catheterization laboratory for transcatheter closure under general anesthesia. The maximum defect size on balloon sizing using stopped-flow technique was 33 mm, and a 36 mm Figulla Occlutech device (Occlutech GmbH, Jena, Germany) was selected. A 16 F Cook sheath (2F larger than the manufacturer's recommendation) was taken to ensure easy manipulation of a large device. The device was loaded onto the delivery system and delivered across the defect using the right upper pulmonary vein technique. The device, however, did not align the septum and protruded through the defect. As the device was being pulled into the sheath, it became obvious that it had not been locked properly at the time of loading and embolized into the right ventricle [Figure 1]c.
A 15 mm Amplatz gooseneck snare (eV3 Endovascular Inc., Plymouth, MN, USA) was introduced via the same 16F sheath and the device was grasped by its screw on the right atrial disk. Once held, the snare was pulled with a constant gentle pressure and the device was brought into the right atrium [Figure 1]d. A multipurpose catheter was passed from left femoral vein to orient the device so that the screw on the disc becomes coaxial with the snare [Figure 2]a. We tried pulling the device into the sheath but the screw slipped out of the snare and device embolized to right ventricle again. We recaptured the device in the same manner and brought it back into the right atrium. This time instead of pulling it into the sheath, we lowered the sheath down into the inferior vena cava and pulled the bare right atrial disc into the inferior vena cava [Figure 2]b. This served as a good stabilizing maneuver but still not good enough to slenderize the entire device into the sheath. 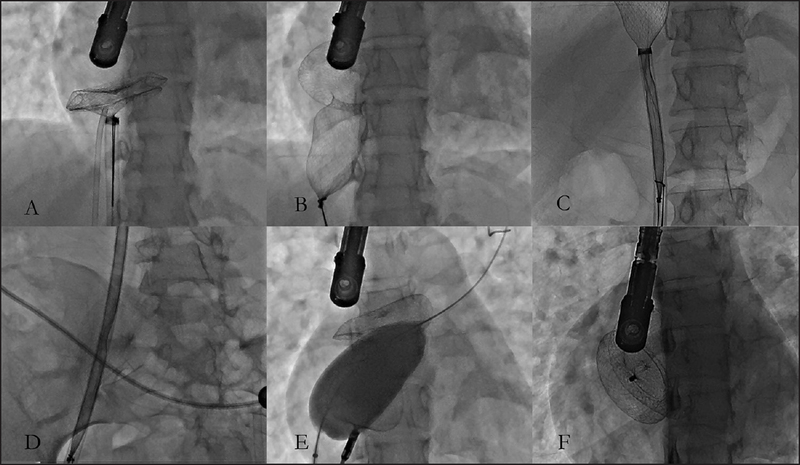 A second smaller snare (5 mm) was passed through the same sheath and the large snare was pushed upwards over the slenderized right atrial disc while small snare was used to hold the right atrial screw firm [Figure 2]c. The entire device could now be slenderized and pulled into the sheath and successfully removed [Figure 2]d. Balloon assisted technique was used and the same 36 mm Occlutech device was successfully deployed [Figure 2]e and [Figure 2]f. The patient was discharged 24 h later on Aspirin (5 mg/kg/day) with check echocardiogram showing an optimally placed device and no evidence of any complications related to embolization or retrieval. On follow-up at 6 weeks, the device was stable with no residual shunt and reduced right ventricular volume. The retrieval of embolized Amplatzer devices is well reported in the literature.,,, There are, however, very few reports on the retrieval of an Occlutech Figulla Occluder.,,, The first three reports are of retrieval from either left ventricle or the aorta and there is only one report of retrieval from the right heart. The operators could not pull the device back into the sheath from the pulmonary artery despite snaring it and the bare device was withdrawn and retrieved via the right femoral vein. Fortunately, they did not have any complications related to retrieval but bare device retrieval cannot be recommended due to its obvious potential complications. Construction and implantation procedures of this device are similar to Amplatzer device but there are some important structural differences including absence of the left atrial clamp to reduce risk of thrombus formation on the left atrial disc. Unlike Amplatzer device that has a screw mechanism, Occlutech device has an integral locking delivery and retrieval mechanism. In our case device embolization resulted from a human error i.e. inappropriate locking of the device. We used a Cook 16 F sheath (instead of the recommended 14F), to ensure smooth delivery of this large device For this reason we did not have to change the sheath for retrieval as you would normally use a stiffer sheath 2F larger than the one used for the delivery to facilitate smooth retrieval of Amplatzer device. This is not true for Figulla device as the main difficulty in Figulla device is in pushing it forward with the flared large profile left atrial hub in front and not in pulling it backwards with the right atrial hub. So the same size sheath as needed for deployment (or even a 2F smaller sheath) could be used to retrieve a Figulla device. Stabilizing the device is crucial for its retrieval. The reported options to stabilize device include a bioptome, a stiff guide wire and a pigtail catheter.,, As there is no left atrial hub on Occlutech device, it did not cross our mind that we could still hold the device by a bioptome from neck approach. This, however, was a good alternative approach, which could avoid pulling a bare device into the IVC. Similarly stiff guide wire or pigtail catheter would only be an option if the device were in a vessel. After holding the device with a gooseneck snare we used a multipurpose catheter to orient the screw on the right atrial disc to be coaxial with the snare to facilitate retrieval. Without stabilization it was not possible to slenderize the device to be pulled into the sheath. After a failed attempt of pulling it, we did two things. One partially brought the bare device into the inferior vena cava (right atrial disc) that stabilized the device and secondly, moved the larger snare up the partially slenderized device and used a second smaller snare (5 mm) to hold it onto the right atrial clamp. Simultaneous pull on both the snares brought the device into the sheath completely and was pulled out of the body. The delivery system of the Figulla device itself is based on bioptome mechanism. After holding the right atrial disc screw with the snare, the delivery cable itself could have been used to capture the device into the sheath. This did not strike us during the procedure but using the delivery cable for retrieval of device is a potential possibility and hence an advantage of the bioptome-based delivery system. In conclusion, it is possible to retrieve an Occlutech device and the absence of a left atrial clamp is not a disadvantage. This report highlights some important additional tips in such a situation with special reference to stability of the device. This research received no specific grant from any funding agency, commercial, or not-for-profit sector. Abaci A, Unlu S, Alsancak Y, Kaya U, Sezenoz B. Short and long term complications of device closure of atrial septal defect and patent foramen ovale: Meta-analysis of 28,142 patients from 203 studies. Catheter Cardiovasc Interv 2013;82:1123-38. Moore J, Hegde S, El-Said H, Beekman R 3rd, Benson L, Bergersen L, et al. ; ACC IMPACT Steering Committee. Transcatheter device closure of atrial septal defects: A safety review. JACC Cardiovasc Interv 2013;6:433-42. Chessa M, Carminati M, Butera G, Bini RM, Drago M, Rosti L, et al. Early and late complications associated with transcatheter occlusion of secundum atrial septal defect. J Am Coll Cardiol 2002;39:1061-5. Sadiq M, Kazmi T, Rehman AU, Latif F, Hyder N, Qureshi SA. Device closure of atrial septal defect: Medium-term outcome with special reference to complications. Cardiol Young 2012;22:71-8. Levi DS, Moore JW. Embolization and retrieval of the Amplatzer septal occluder. Catheter Cardiovasc Interv 2004;61:543-7. Jang SI, Kim SH. TCTAP C-132 the retrieval of the embolized occlutech figulla flex II in the left ventricle of child. J Am Coll Cardiol 2015;65:S307-9. Pala S, Açar G, Tigen K, Kırma C. Percutaneous retrieval of an interatrial septal occluder device embolized into the aortic arch. Turk Kardiyol Dern Ars 2010;38:502-4. Jahrome AK, Stella PR, Leijdekkers VJ, Guyomi SH, Moll FL. Abdominal aortic embolization of a figulla atrial septum occluder device, at the level of the celiac axis, after an atrial septal defect closure: Hybrid attempt. Vascular 2010;18:59-61. Pac A, Polat TB, Cetin I, Oflaz MB, Balli S. Figulla ASD occluder versus Amplatzer septal occluder: A comparative study on validation of a novel device for percutaneous closure of atrial septal defects. J Interv Cardiol 2009;22:489-95. Halabi A, Hijazi ZM. A new device to close secundum atrial septal defects:First clinical use to close multiple defects in a child. Catheter Cardiovasc Interv 2008;71:853-6. Shirodkar S, Patil S, Pinto R, Dalvi B. Successful retrieval of migrated Amplatzer septal occluder. Ann Pediatr Cardiol 2010;3:83-6. Chan KT, Cheng BC. Retrieval of an embolized amplatzer septal occluder. Catheter Cardiovasc Interv 2010;75:465-8. Goel PK, Kapoor A, Batra A, Khanna R. Transcatheter retrieval of embolized AMPLATZER septal occluder. Tex Heart Inst J 2012;39:653-6.